Voyages made in the years 1788 and 1789, from China to the North West coast of America. To which are prefixed, an introductory narrative of a voyage performed in 1786, from Bengal, in the Ship Nootka; observations on the probable existence of a North West Passage; and some account of the trade between the North West coast of America and China; and the latter country and Great Britain. London: Logographic Press, sold by J.Walter, 1790. 4° (285 x 230mm). 5pp. subscribers' list, 28 engraved plates, coastal profiles and maps, 10 folding, after T.Stothard and others by J.Wells and others. (Small tears to folds of first two maps, some light spotting, some plates close shaved.) 20th-century calf, red morocco lettering-piece to spine (spine faded). FIRST EDITION, OF THIS IMPORTANT WORK: 'Meare's voyages resulted in the Nootka Sound affair between Britain and Spain, and were the foundation of Britain's claim to Oregon, later ceded to the United States' (Abbey). 'John Meares was sent out in 1786 from Calcutta, by a group of merchants, to enter into the fur trade of the northwest coast of America. Establishing himself at Nootka Sound and flying the British flag, he built the first vessel to be launched in northern waters, made important discoveries, and explored the Strait of Juan de Fuca. The discoveries by Meares were part of the basis for the claim of Great Britain to Oregon. Competition with the Spanish almost caused war between the two countries and this struggle became known as the Nootka Controversy. The Spanish seizure of his ships led to the convention by which the Spanish claims to any northern territory were finally disallowed. This important narrative gives a very full account of the Indian nations of Northwest America, describing their villages, languages, manners, and customs. 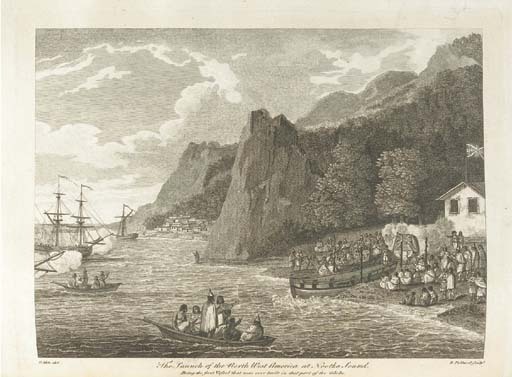 It also contains a separate account of the voyage of the Iphegenia, commanded by Captain William Douglas, which visited the Sandwich Islands and Nootka Sound'. (Hill). Abbey Travel II, 594; Cordier 2103; Hill I, p.195; Staton & Tremaine 612; Sabin 47260.